Here are some reactions from me. 10. (Absolute dogmatism leading to violent inconsistency) Yes. So we watch out to make sure we are not getting into that way of thinking. 9. (Ideal plans falling into quicksand) This is a comment on the age-old tussle between, roughly speaking, left-wing and right-wing politics. I think we need both, and we need to keep tussling. 8. (A glass of wine). Yes. But there is also much that a glass of wine does not show us. It does not show us anything which is not an “it”. It does not tell us what empathy is, nor what forgiveness is, nor justice, nor hopeful political reform. 7. (Doubt, approximate answers, possible beliefs). Yes, up to a point. I too am not absolutely sure of anything, but I would commit a great deal to the defence of certain propositions. It is easy to find examples. I would risk my very life if that was the only way I could see to protecting some things, such as a room full of children in the presence of a madman with a gun. So I would defend the proposition that those children should be protected; I would defend it just about as forcefully as I could. That is an extreme example, but once you admit there can exist such examples, immediately the whole question of degrees of certainty gets re-framed. Feynman is right to say that abstract questions such as the purpose of the universe are not particularly helpful and we don’t need answers to them. But we do need answers to more immediate questions, such as “what shall I do this afternoon?” That is what authentic transcendence (to borrow a phrase from Dietrich Bonhoeffer) is about. It is about responding to the needs of my fellows in the here and now. I think Feynman begins to drift into incoherence at the end of this quote, when he speaks of “being lost in a mysterious universe without having any purpose, which is the way it really is, as far as I can tell, possibly.” That last “possibly” is a bit of a cover-all. Absolutely anything can be stated with a qualifying “possibly” at the end. Every statement we ever make has that qualification implicitly attached to it. But what statements shall we make? Shall we remind ourselves that the universe and our lives might be without purpose, possibly? Well, perhaps once a year or once a decade we should remind ourselves of that. We should go to a play by Samuel Beckett once in a while. But that is not the way to live our daily lives. It is worth taking care to write your scientific paper accurately (possibly). It is worth giving your children an encouraging smile (possibly). It is worth restraining your violent impulses and nurturing your respectful non-violent ones (possibly). Your life has a great deal of purpose (possibly). If ever you come to a place where you really lose sight of that, then you have my sympathy but I hope someone will help you to think differently. 6. “God was invented to explain mystery … God is always associated with those things that you do not understand”. The trouble with this quote is that Feynman appears to have failed to realise that religious thinkers have long recognised the emptiness of this way of thinking. Of course we have. It is so obvious. Failing to recognise or acknowledge the existence of intellectually serious religious discourse is like failing to recognise the difference between science and pseudo-science. You can find plenty of pseudo-science in the world today (homeopathy, some of the claims made about cosmetics, some of the claims made by climate-change sceptics, etc.) and it is right to denounce pseudo-science. But in doing so, it would not be right to bundle pseudo-science and science together into one thing and denounce that. Similarly, it is intellectually inadmissible to talk breezily of “God” in terms that bundle together muddled religious ideas with intellectually serious ones, without any attempt to recognise the difference between them. Intellectually serious religious ideas are what you find in the writing of Ludwig Wittgenstein, for example, or Simone Weil or Rowan Williams. If you read the reactions to Jesus of Nazareth that you can find in the New Testament documents, you do not find him particularly interested in locating God in things not understood. Rather, he was interested in offering a way forward from guilt, and a way of re-framing human society. He was interested in seeing truthfully and with empathy, not locating God in things he did not understand, but joining in with God in human situations he did understand. 5. “reality must take precedence over public relations” Yes. 4. “But there are tens of thousands of years in the future. Our responsibility is to do what we can, learn what we can, improve the solutions, and pass them on.” Yes, it is helpful to realise that the future may be very long. Note that here Feynman talks about responsibility, and so (of course) he does think that our lives have purpose (see under (7) above). 3. “We absolutely must leave room for doubt or there is no progress and no learning. There is no learning without having to pose a question. And a question requires doubt. People search for certainty. But there is no certainty.” Yes. I completely agree with the whole of quote number 3 above. 2. On government and freedom. Yes, this is a good broad statement about the role of government. Yes. Go and read the book of Job, and a few other Biblical writings, and there you have this very thing, already seen and expressed thousands of years ago. Well yes, but who ever said that it is all arranged for God to watch? Not me. Not the author of Job. Not the Psalmist, nor the authors of the Gospels. Not Jesus of Nazareth. Especially not him. Not Francis of Assisi. Not any other serious religious commentator. Starting out from insight and wisdom, Feynman here sees the “G-“ word on the horizon, and suddenly he descends into stupid shallow ways of using that word. The “God” he alludes to here is indeed some sort of stupid idea, a thing that simply does not exist at all, nor have any role in our existence. But to use the “G-“ word in this way is simply to take a word that is used by serious thoughtful people in one way, and use it in a completely different way. That is what incoherent speech essentially consists in. 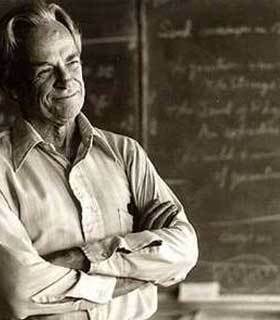 It is a pity to leave our visit with Richard Feynman’s writings on this rather ignorant comment from him. What he is tackling is, of course, one of the forms that religious expression can take, so we can agree the shallowness of the thing he rejects here. But what he fails to grapple with, both here and elsewhere in his writings, is the idea that we don’t have to be shallow in our attempts to speak about what it is that human beings experience when they experience God, or when they don’t know exactly what they experience, but find themselves reaching for something not adequately expressed in analytical language, and not adequately engaged-with in a passive, impersonal mode. I have a lot of regard for Feynman both as a scientist and as a human being, so I will finish with a brief comment on why it is that intelligent people can fail to see the truthfulness of some forms of religious language. It is, I think, largely because they never encountered it. They encountered, instead, a morass of muddled, superstitious language, and got the feeling there was no need to explore further in that direction, because they were already content with devoting their time and energy to more clearly productive things. It is only when you see faith in God causing really creative things, things like joy and mutual recognition, help for otherwise hopeless people who fall through the cracks in society, massive investment in open education or political liberation, civil rights movements, ecological wisdom and effort, trustworthy business practice, and so on, that you will take it more seriously. Or when you become painfully aware of failure in yourself: breaking promises and lying, anger and bitterness, and so on. The reason that there is so much superstitious nonsense in Christian churches is that the church tries to be inclusive. The church is not a club for the respectable, it is a rowing-boat for the unrespectable. Pastors and ministers are sent to theological college largely so that they can be trained in how to combat the superstition that they will encounter in their congregations. Yes, theology is all about combating superstition. Faith and superstition are close to opposites. The first is based on trust and effort in the pursuit of truth, the second is based on fear and laziness. Wonderful website. Plenty of helpful info here. I’m sending it to some pals ans also sharing in delicious. And certainly, thank you for your effort!